In the 50s and 60s, traditional trucker's stopover lodgings were regular sights at the side of the roads, as were roadside cafes at one time. This particular driver's Hotel was located in London, just off the A3 Clapham Road. 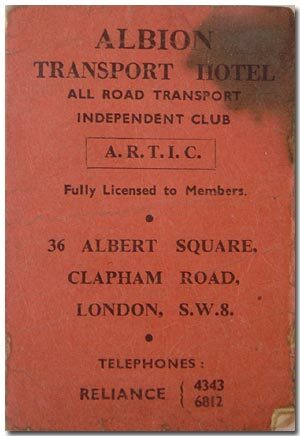 This interesting little folded card was for the Albion Transport Hotel, which was a member of A.R.T.I.C. - All Road Transport Independent Club. The Albion Hotel, named perhaps after the famous British lorry manufacturer, was located at 36 Albert Square, Clapham Road, London SW8. The blurb inside goes on .. "The only known ... Fully Licensed Hotel in England - Catering solely for the exclusive use of Long Distance Transport Drivers.". So evidently this was aimed squarely at lorry drivers who needed somewhere to kip over for the night. Perks of the hotel included central heating throughout the hotel (welcomed by many weary truckers I'm sure), a television in the bar lounge, and "latex foam mattresses on interior sprung divans ensuring utmost comfort". Breakfast was served 6am-8.30am, Dinners 5pm-8pm, and Suppers 9pm-11pm. Day drivers were charged 12'6 and Night drivers 11'-. Two keys were available for each driver, and toilet goods obtainable from the bar counter. Night drivers were especially welcome. Tucked inside are a few receipts dating to 1965 - there is a petrol receipt from 1965 for petrol purchased at Denshaw Garage, near Oldham. From five days later is another petrol receipt, this time for fuel bought at Regent Service Station, Moss Grove, Kingswinford. Another receipt, for the same month (but this time from Kingswinford Service Station, of Brierley Hill, Staffs) is for 8 gallons of Mobil Special, plus 2 pints of Mobiloil.